Q. Why is REFLUX GUARD better then a pillow wedge? Most pillow wedges aren’t the full width of the mattress. As you sleep, you are more limited in space and comfort. REFLUX GUARD is placed under your current mattress. This means you can enjoy the entire top surface of your bed without any loss of comfort or space. REFLUX GUARD is stable and doesn’t shift as you sleep. You can’t accidentally bend at the abdominal area which would result in increased pressure and may actually aid rather than prevent acid reflux. REFLUX GUARD fits under your mattress. You can put it in place and leave it there for years. A pillow wedge is in bed with you, which means it must be washed often and replaced every year or two. We know of original REFLUX GUARDs still in use after ten years. We are so confident REFLUX GUARD will hold up, we offer a TEN YEAR WARRANTY*. With REFLUX GUARD you get a good night’s sleep for less than a nickel! REFLUX GUARD offers a convenient retention strap (sold separately) that allows you to roll up your wedge for storage and easy transport. Q. 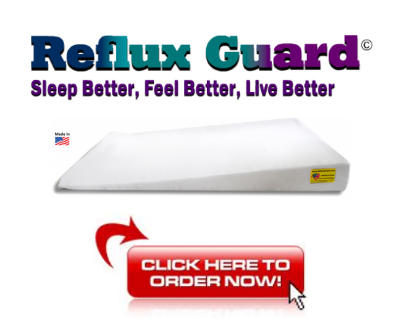 Will the Reflux Guard support a heavy mattress or person? A. Yes, Reflux Guard could easily handle the weight of the heaviest mattress and person because the weight gets distributed/diffused. In most cases it translates to less than 1/10 of a pound per square inch. Additionally, we give a 10 year guaranty on the height. if the head sags more than 1″, the product is eligible for replacement. Q. Is there any position I can’t sleep in? A. Not really. REFLUX GUARD will work no matter how you sleep, though studies have shown that sleeping on your left side is preferable. Q. How much is the head of the bed actually raised when the wedge is in place? A. The head of the Reflux Guard Wedge is 6″ (from 0.001″) Raising the Bed 6″. If you need higher the Reflux Guard is adjustable and can be slipped down and raise the 6″ to 7″ plus. Q. Adjustable? How do I adjust the height to attain a higher incline? A. Since RefluxGuard is 60 inches long, (which is a little less than mattress length) it can slide down closer to the foot end of the bed, thereby increasing the incline. Therefore raising the head of the bed from 6 inches to 6.2inches and so on (up to 8″ high), as it is slid down. Q. How soon after unpacking my Reflux Guard can it be installed under the Mattress? A. We recommend waiting 24-48 hours. it varies how recent the foam was packed and what temperature it shipped through for the decompression cycle to be completed and fully expanded. At times, it will decompress fully within an hour of unboxing, some have reported that they saw it decompressing even after placing it under the mattress. Q. How long does it take before I can expect to feel results? A. REFLUX GUARD is easy to use and most users report feeling better within a few days. Q. What is the Reflux Guard made of? A. Our wedges are made with Polyurethane Foam. Fabric used for the covers are a Cotton/polyester blend. it is a High Quality, Easily washable – with heavy duty zippers – made to last for years. Q. Can I travel with my REFLUX GUARD? A. Yes, absolutely. The convenient REFLUX GUARD retention strap (sold separately) allows you to roll up your REFLUX GUARD and throw it into a vehicle or storage. Q. Does sleeping on the Reflux Guard equipped bed a substitute for medical guidance? A. No. While your doctor has or will tell you lifting the head of your bed will likely result in relief, there could be other conflicting medical problems that need to be addressed. We recommend anyone using the REFLUX GUARD be under the care of a physician. Q. Who Developed REFLUX GUARD? Q. How soon can I expect my order? A. Orders are usually shipped within 12-48 hours (when in inventory). Items are shipped from New York via UPS Ground. Estimate Transit time is 1-6 business days. Q. Does REFLUX GUARD ship to foreign countries? Return Policy applies to complete units only. it does not apply to foam alone (listed as ‘Parts’). our new 30 return policy only applies to orders purchased on 2/7/2018 and thereafter. See Return Restrictions here. All returns must be pre-approved, require a return authorization number (RA#). please contact us here for return request and instructions. Warranty does not apply to foam alone (listed as ‘Parts’). If you purchase the cover within 2 weeks of purchasing the foam, the warranty applies.